April showers bring May flowers, and then wedding season! With the impending frenzy of nuptials, gift buying can become a costly, tiring and time consuming task. Not to mention the added stress of buying for a couple you may or may not be well acquainted with. To save yourself the anxiety of buying the perfect gift, read on for some awesome gift ideas that are sure to please. Nowadays you can have pretty much anything personalized for the lucky couple, from tea towels and cutting boards to engraved picture frames and shadow boxes. A personalized gift bearing the couple’s initials in an elegant monogram makes for a tasteful and thoughtful gift. 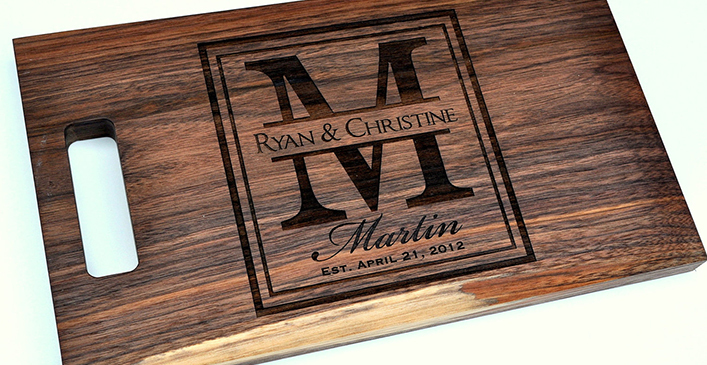 Personalizing a gift by having it engraved or etched is also a fantastic way to step up an otherwise tame gift.